First they were friends, then they were 'dating', then they broke up... then she turned 18. Can anyone keep up with the drama? 1. It all started when Tyga performed at Kendall Jenner's Sweet Sixteen Birthday party. It appeared that 14-year-old Kylie first had something for Tyga when she bumped into him at her sister's sixteenth birthday party. 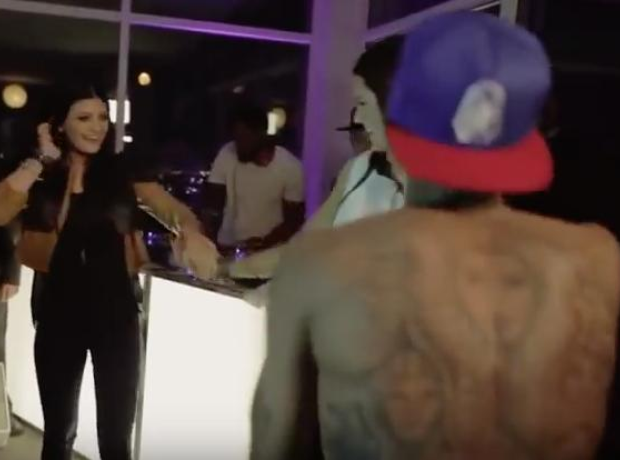 He had been invited to perform at the event back in 2011 and she can be seen awkwardly flirting with Tyga in the corresponding episode of 'Keeping Up With The Kardashians'. 2. Then, in 2014 Tyga began appearing in Kylie Jenner's Instagram posts. After attending Kim Kardashian and Kanye West's wedding, Kylie began hanging out with Tyga and his friends such as Chris Brown and Trey Songz. 3. Tyga broke up with his fiancee Blac Chyna. 4. Tyga addressed Kylie Jenner rumours. With rumours circulating that he ended his relationship with Blac Chyna because of Kylie Jenner, he defended his actions on Twitter, claiming that he was just friends with the Kardashians. 5. Then Kylie Jenner started appearing in Tyga's Instagram posts. In October 2014 Kylie Jenner started making appearances in Tyga's social media posts as he mentioned that he was surrounding himself with "good people, good hearts, good souls". 6. Tyga and Kylie celebrated Halloween as Chuckie and Chuckie's Bride. Kylie posted this Instagram picture of herself and her 'friend' Tyga wearing matching halloween outfits. 7. Then things got interesting when Drake posted a picture of Kylie Jenner at his house. 8. Kylie and Tyga volunteered together. 9. Kylie Jenner addressed Tyga rumours. Kylie Jenner used Twitter to dismiss rumours that she was in a relationship with Tyga and that he was helping her start a career as a rapper. 10. What exactly happened between Tyga and Kylie after Grammy weekend? 11. Drake used Kylie Jenner's age to diss Tyga on '6pm In New York'. Drake released a surprise mixtape called 'If You're Reading This Its Too Late' and included a few shots at Tyga on one of its standout tracks. He rapped: "I heard a lil lil homie talking reckless in Vibe/Quite a platform you chose, you shoulda kept it inside/Oh you tried, it’s so childish calling my name on the world stage/You need to act your age and not your girl’s age." 12. Khloe Kardashian defended Tyga and Kylie's relationship. Amber Rose brought up Kylie Jenner in an interview, saying: "Tyga should be ashamed of himself. For sure. He has a beautiful woman and a baby and left that for a 16-year-old who just turned 17". Khloe defended her sister by suggesting people didn't know the truth. 13. Tyga denied dating Kylie Jenner in an interview. Soon after the comments by Amber Rose, Tyga went on the radio to deny that he is dating Kylie Jenner. He also made it clear that he did not leave his family to be with Kylie. 14. Kanye West said Kylie and Tyga are in love. During a rare radio interview Kanye West said that Tyga and Kylie Jenner are in love. He also added that Tyga was "smart" for getting in early with Kylie. 16. Kylie Jenner and Tyga went on a number of dates. 18. Kylie sparked engagement rumours after being spotted with a ring. 19. Tyga admitted that Kylie has 'captured his heart'. Tyga posted a picture of Kylie on Instagram alongside the caption: "Certain things capture the eye, but only few capture the heart". 20. Rumours spread that Tyga slept with a transgender. Rumours spread that Kylie had broken up with Tyga because he cheated on her with a transgender. Although he didn't directly deny the accusations, he used Twitter to poke fun at the situation. 21. Tyga bought Kylie a new Ferrari for her 18th birthday. 23. Kylie Jenner and Tyga are spotted looking cosy on the front row at the 2015 MTV VMA's. 24. Tyga released an official music video for 'Stimulated,' starring Kylie Jenner. If it wasn't obvious already, the two now confirm their relationship by getting intimate in the official music video for Tyga's new song. 25. Kylie Jenner released a cryptic snapchat post amid rumours that she had broken up with Tyga. According to TMZ, Kylie Jenner broke up with Tyga on his 26th birthday because of "influence from the Kardashians". After news spread, she released a cryptic snapchat playing Bryson Tiller's 'Been That Way' in the background. The standout lyrics from the clip were "I wanna know how we became so distant." 26. Kylie Jenner denies breaking up with Tyga. Kylie Jenner appeared on US chat show Ellen and denied splitting up with Tyga, claiming that "people have got it all wrong". She said: "We’re not broken up. We became best friends before anything happened, so I think that that’s awesome and we’re just like, hanging out". 27. Kylie teased fans during Christmas 2015 by posting a photo of a large rock Tyga bought her. But she later confirmed on her website that the two aren't engaged. "It was really special to end such a big year celebrating with all my friends and family... and with an extra special gift from a special someone," she wrote. "And NO, I'm not engaged :)." 28. Kylie Jenner and Tyga reportedly break-up after dating for two years. 29. Tyga throws shade at Kylie Jenner and PARTYNEXTDOOR. 30. Kylie Jenner shuts down rumours about a sextape with herself and Tyga. 31. Tyga says Kylie Jenner "overshadowed" his talents. Tyga claimed that his relationship with Kylie Jenner "overshadowed" his talents and things he worked hard for, in an interview with Big Boy in the US. 32. Amid rumours they are back together, Kylie tagged Tyga in a bedroom picture. 33. Then, in June 2016, Kylie Jenner and Tyga were spotted having some PDA, confirming they're an item. 34. Tyga buys Kylie Jenner a brand new Maybach for her 19th birthday. Tyga bought Kylie a brand new Maybach as a present for her 19th birthday. The rapper shared a video of her receiving the gift on his Snapchat. 36. In February 2018, Tyga reportedly called for a paternity test on Kylie's daughter, Stormi Webster. Kylie gave birth to a baby girl, Stormi Webster, on February 1st 2018, her first child with rapper Travis Scott. However, Tyga claimed he was still sexually active with Jenner around the time she would have conceived, and demanded a paternity test. 37. Tyga then responded by distancing himself from the Kardashian family. 38. Tyga claimed that Kylie Jenner needed "black people to f*ck with her" during an interview.